Home Secretary Theresa May has announced that victims of anti-social behaviour will be allowed to choose the punishments those found guilty receive. She told the Conservative Party's annual conference that they would pick from a "list of options" ranging from "restorative" to "punitive". "They might want it to be carried out nearby or as far away as possible," Mrs May added. She also argued that the Conservatives were the "party of law and order". In her speech to delegates in Birmingham, the home secretary paid tribute to Fiona Bone and Nicola Hughes, the policewomen killed recently while on duty in Manchester on 18 September. She said: "Their deaths were a dreadful reminder of the risks our police officers take in protecting their communities every day: putting themselves in harm's way, going into dangerous situations unarmed, not knowing what they might come up against. "We have the finest police officers in the world, and we owe them all a deep debt of gratitude." Mrs May insisted that, despite cuts to police forces' budgets, crime would not rise. 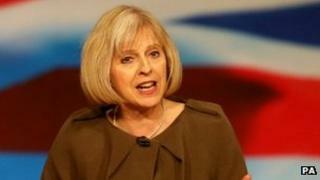 Criticising the previous government's record, she said: "We need to cut the bureaucracy and get back to fighting crime. So we've taken an axe to police red tape, saving up to 4.5 million police hours a year and getting the equivalent of an extra 2,100 officers back onto the streets. "We need to give the police the freedom to use their judgement. So we've scrapped all police targets and given them a single objective - to cut crime. "We need police forces to be run efficiently with their resources in the right places. So we're rooting out waste, joining up procurement, and reforming police pay so we reward crime-fighting, not just time served. "Put simply, we need police forces that are single-minded about fighting crime." She warned of an "underbelly" of gang culture in cities. Moving on to anti-social behaviour, Mrs May promised: "We will change the law so when a criminal receives an out-of-court community punishment, the victim will be given the power to choose the form it takes. "They'll be given a list of options. They might want something restorative or punitive. They might want it to be carried out nearby or as far away as possible. But what matters is that the punishment will be chosen by the victim. "For too long, victims of crime have had no voice - but this government is giving victims back their voice." Mrs May argued that elections for police commissioners in England, which take place next month, would ensure this. In a speech following the home secretary's, policing minister Damian Green joked about the replacement of Ken Clarke as justice secretary by Chris Grayling, who is considered to be more of a hardliner on law and order. He said: "Theresa used to lock them up and Ken let them out. Now... Theresa locks them up and Chris throws away the key."